Hi folks! 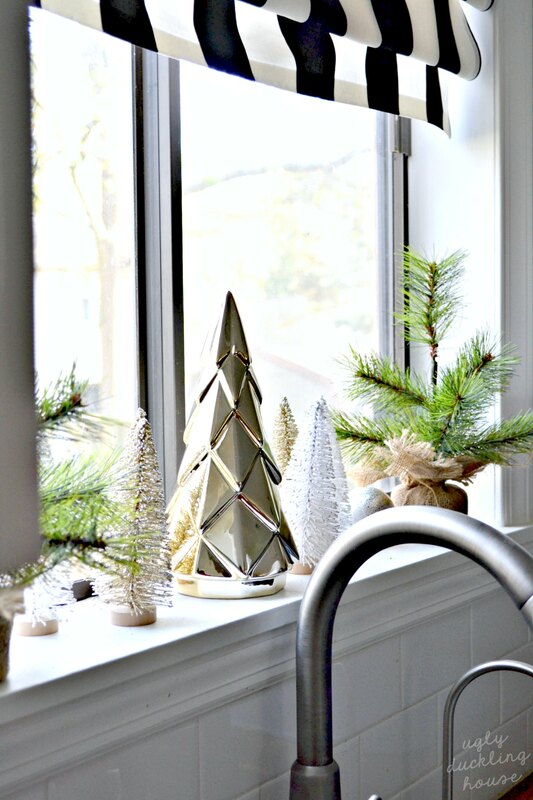 And welcome to my little Christmas house tour for 2017. This year, there was a HUGE milestone worth celebrating: my very first time hosting my family for Christmas dinner and opening gifts at MY house. My sister and her boyfriend will be out of town for the 25th, so we decided on an early date as a family. That meant prepping early, deciding our menu, and making sure the house was ready for not only the six of us (Mom, Dad, Em, her bf, me, and K), but the six dogs that are a part of the family, too! I will happily report that only one of them had an accident (coughcough Buddy), but I’ll get to the actual family gathering later. 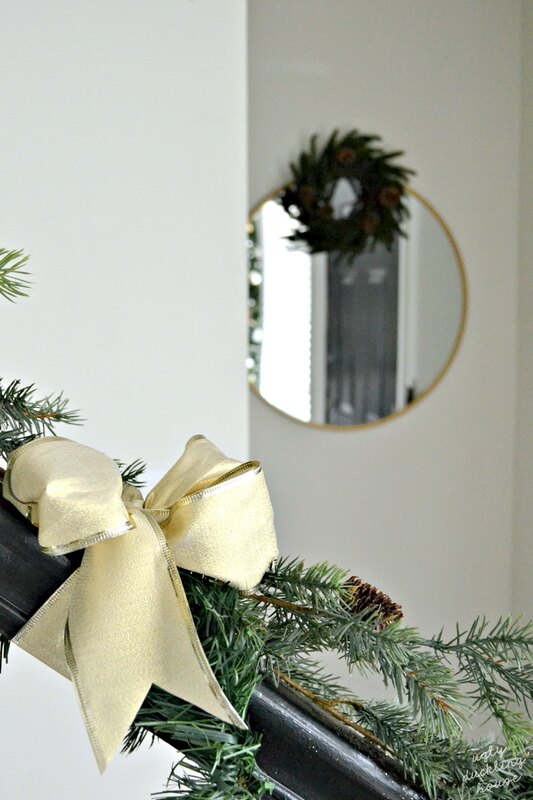 Over the next three posts, I’ll be breaking down the house decor so you can get the full tour (even if you caught my live Instagram on Saturday night, this one will have much better lighting and fewer wine stains on my lips, ha). Let’s start with the entryway and kitchen. Just going to fess up now: some of these pics were taken as I had all six pups visiting. So things like a muddy front door and fur everywhere are just a given; please don’t judge too harshly on my lack of enthusiasm for cleaning as guests arrived (I have my tricks, but six dogs is a lot of dogs). 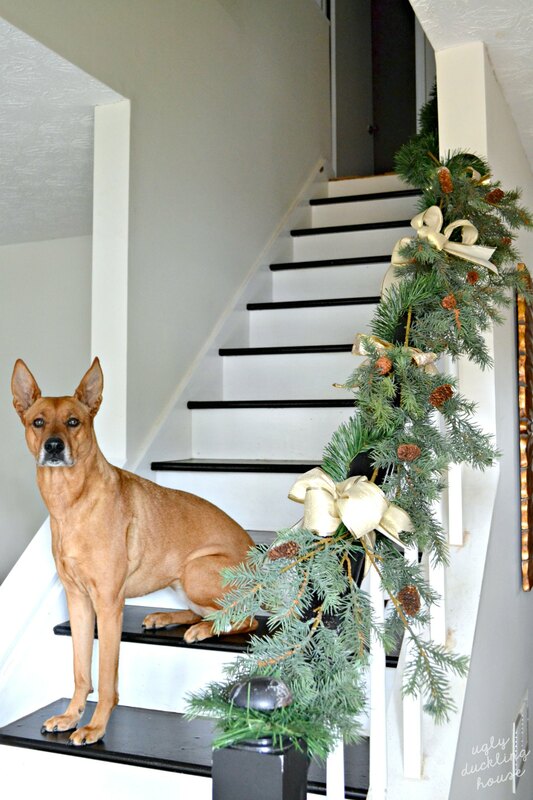 Those of you who remember when I first painted my staircase might see a little familiar staging here with Charlie, but that pose is all her! She picks this middle section of stairs as one of her favorite observation spots in the house (her other favorite is right at the bottom, on the dog rug, with her head resting on the window sill and looking out for any evildoing mail carriers). Confession: because of Charlie’s frequent trips, I had to repaint scratched up spots this year. I’ll have a post for you soon on how I’m planning on keeping them more pristine in the future (some areas just haven’t held the paint well, so that’s going to get revisited in 2018). 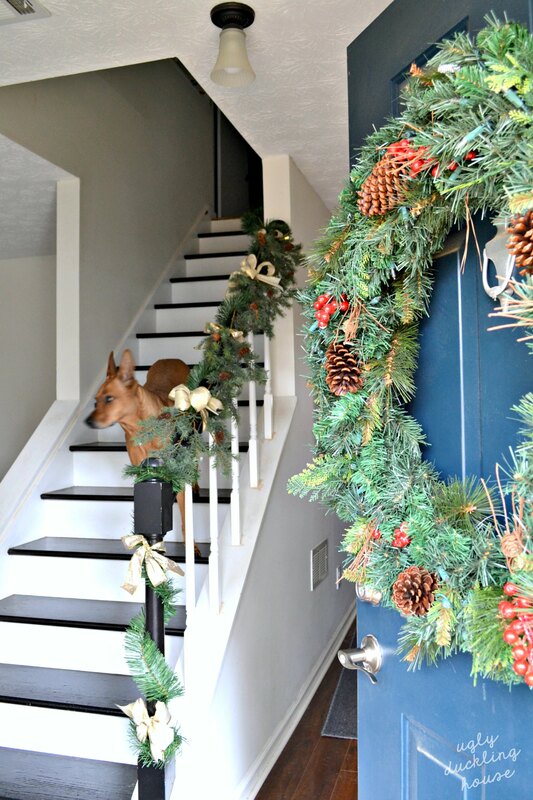 The entryway is fairly plain right now, but that made a great blank canvas for letting the Christmas decorations shine all on their own. 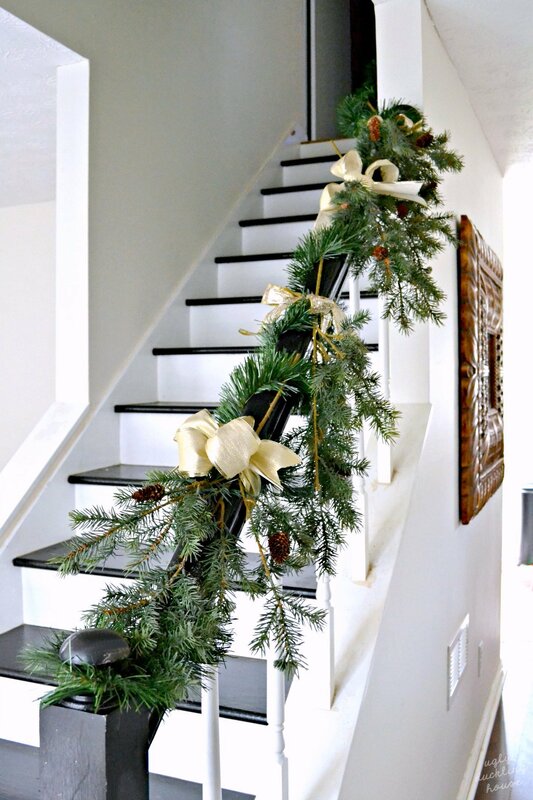 I have a few more plans to really bump up the front hallway’s presence in 2018! Things like adding small shelves for dropping keys, a place for quick shoe storage, etc. 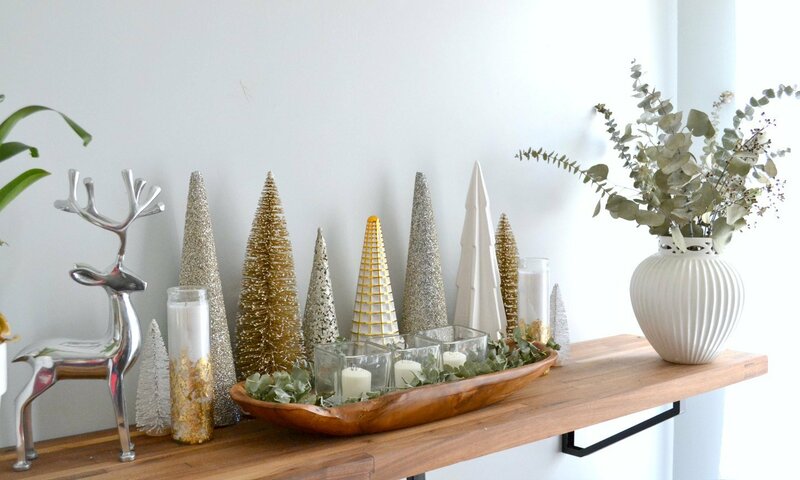 I seem to really like trees whenever I go Christmas clearance shopping (bottle brush trees, ceramic trees, really abstract-looking cones that might look like trees when sitting next to other trees, etc.). I’ve amassed quite a collection at this point (and probably won’t be stopping just yet). 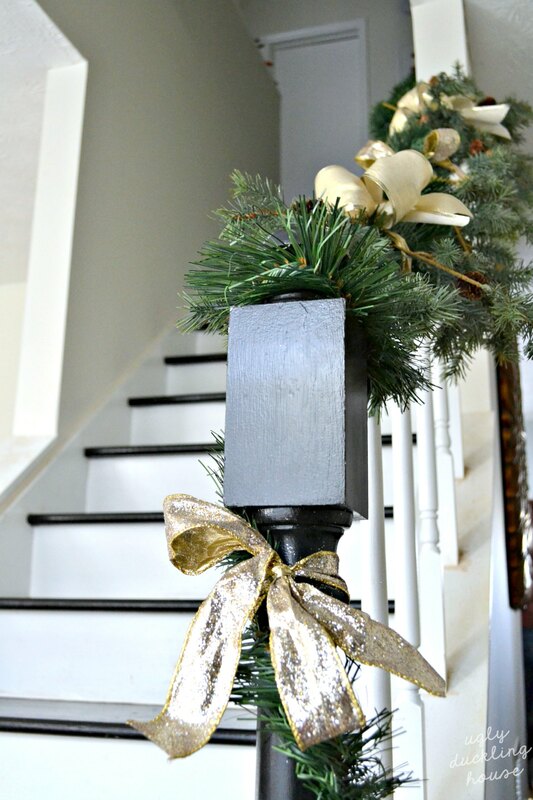 I took a few to use around the mantel in the living room, but the rest all went into the kitchen, along with all of the other white, silver, and gold elements I could find from my Christmas boxes that I keep stored in the attic. Speaking of the attic, one of my blog partners this year, Sears Parts Direct, would like me to remind you that going up to the attic for Christmas decor is a great opportunity to check and switch out your HVAC filters (it’s something I do myself because I’m prone to forget, so I actually keep an extra stashed up there ready to switch out when I go up there during the winter — convenient tips and tricks, people, that’s what I’m all about). If you need a reminder system where filters ship to you when they’re ready to switch out, Sears Parts Direct has an automatic reorder program for that here. The smallest bottle brush trees are new this year, which I found from the Target dollar spot for just a few bucks each. I really wanted more, but they get scooped up so quickly that only the little ones were left by the time I found them (and this was November!). They still made for a nice collection along the kitchen window sill. The rest of the trees (from places like Joann’s, Target, Michael’s, Homegoods, etc. collected over the years) all went along the kitchen bar area (I thought of actually using this space for cheese & drinks during the afternoon, but decided to use as a display instead). 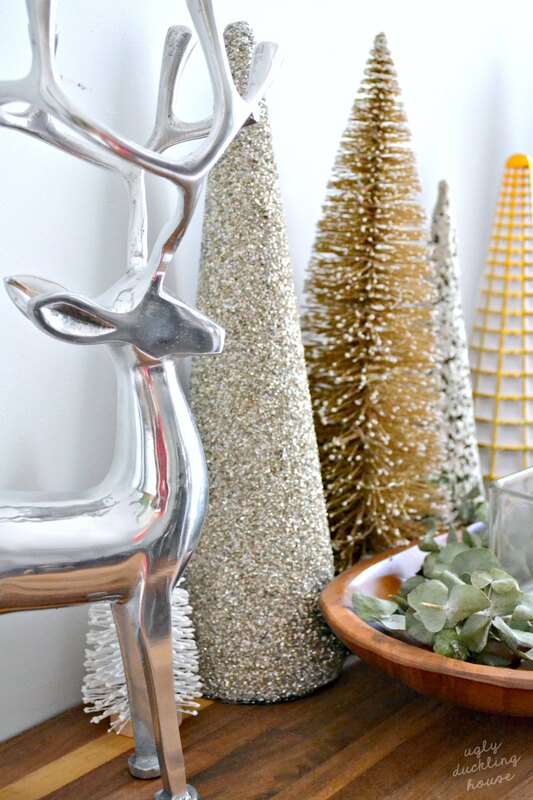 You might also recognize the silver reindeer from previous years’ decor, the gold leaf candles from last year’s NYE crafts, and the centerpiece from my fall tablescape. So, that’s about all the photos and all the details that are probably appropriate for one post. I have lots more, so I don’t want to give you just one post where it takes forever for the pictures to load! 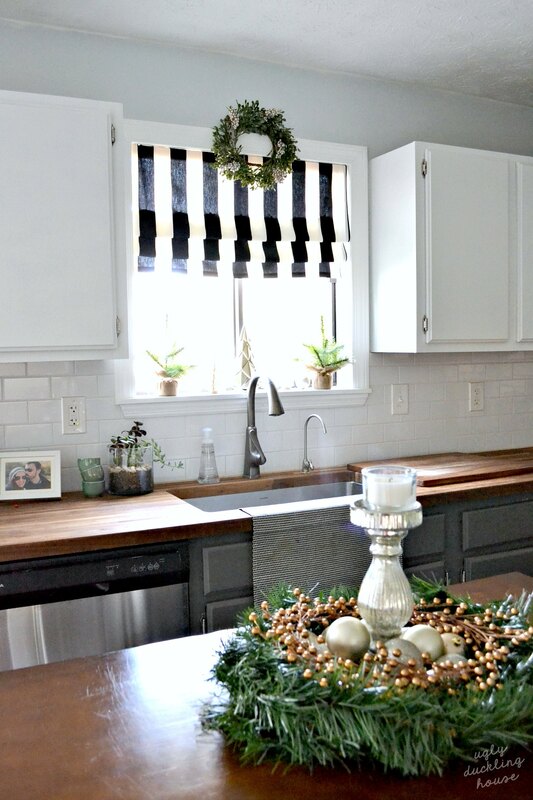 Come back Wednesday and Friday for more (I can’t decide yet if I’m going to do the dining room or the living room next, but probably in that order), along with a recap of our Christmas celebration. Be prepared for lots of photos of dogs; I thought it best to take photos as the chaos unfolded to show you a “real” view of what our holiday was like. It’s… very real. More soon! Are any of you doing your Christmas on a different day this year? It seems like our holidays get tossed around a little more with significant others and family schedules; I assume this is pretty normal and will probably continue as we get older. Merry Christmas! My family does holidays on other days all of the time, for example, my husband and I do Christmas for just us on Christmas Eve. Cute idea! I think K and I will do something separate Christmas night (since he has to travel back from his family stuff vs. mine).